On April 4, 2018 at approximately 2 p.m., Winter Haven Police responded to a call regarding a firearm that was found inside of a backpack of a 14 year-old student, identified as Conner Belisle (7th St, Dundee FL). At the time of the call, the school administration had the backpack and weapons secured and the student was isolated with administrators. When officers arrived, they were directed to the principal’s office where the backpack was located. Inside of the backpack were two knives, (1) butterfly style and (1) SOG brand folding pocket knife. 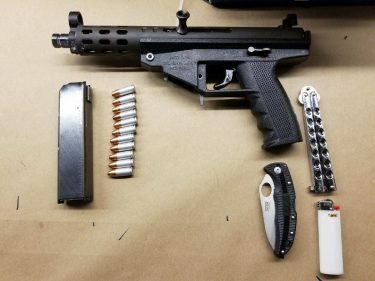 Also found was a Kimel AP-9 semi-automatic pistol with 11 rounds of ammunition. Belisle told investigators that he recently had been listening to rap music and wanted to bring the gun to feel “powerful” and “cool”. He obtained the gun, which belongs to his father, from his home the night before. Belisle was taken into custody without incident and booked into the Polk County Detention for Juvenile Justice on charges of one count of Possession of a Firearm on School Grounds (F3) and two counts of Possession of a Weapon on School Grounds (F3).